Now in its thirteenth season, the Music at Paxton festival is set in the spectacular rolling scenery of the Scottish Borders outside Berwick-upon-Tweed. This season its programme of chamber concerts has attracted such international performers as Pascal Rogé and Steven Isserlis. Lasting nine days with sixteen concerts I joined the festival seven days in with a Friday evening chamber music double bill played by Hebrides Ensemble. Most of the concerts are given in the striking setting of the Paxton House Picture Gallery with its domed glass ceiling. For the first of its concerts the Hebrides Ensemble lined up as a piano trio commencing with English music, Frank Bridge’s Miniatures Set 2 an attractive, undemanding score in three movements. Although written for a pupil of Bridge I noticed how the trio lavished great care on the moderate level pieces playing with utmost integrity, mindful of avoiding overstatement. New to most of those present I’m sure was Nigel Osborne’s The Piano Tuner an arrangement for piano trio of material taken from his 2004 opera of the same name. Cast in eight short movements the writing frequently fuses conflicting tuning systems and modes. Assuredly the players revelled in the character and diversity of the writing which was intended to be the sort of music the piano tuner might have heard on his travels to Burma, tasked to tune a piano for a military medical officer. Concluding the concert in some style was an outstanding performance of Debussy’s Piano Trio. Written by eighteen-year-old Debussy the four-movement score was thought lost until discovered over a hundred years later. Giving due regard to this student work the players came together effortlessly, displaying an intuitive feel for the music which concluded with an uplifting sense of optimism. For the second of its evening concerts the Hebrides Ensemble returned to the stage as a piano quartet. Opening the programme was Mahler’s Piano Quartet not a work that appears in concert too often. The single movement marked Nicht zu schnell appears to be part of a projected piano quartet commenced whilst Mahler was a student at the Vienna Conservatory. Admirable was the way the players underscored the surging mass of passionate writing that rages through the work, climbing so impressively before falling back to a sense of calm relief. Master of The Queen’s Music for four years now Judith Weir wrote Distance and Enchantment for piano quartet in 1989. It’s a work based on two traditional melodies about two separate people, a woman and a girl who vanished mysteriously, never to return. Clearly enjoying playing Weir’s confident and orderly contemporary music, infused with an abundance of darkness and relentless agitation, the players took the opportunity very much in their stride. The jewel of the day’s programme was undoubtably Brahms Piano Quartet No.3 a work begun when in his early twenties but not completed until 20 years later. It’s a work that might easily mirror the composer’s fierce and wavering self-doubts to which Hebrides Ensemble gave a characteristically eloquent and expressive performance that made a significant impact. Noticeable was the Hebrides Ensemble’s unity together with such compelling artistry. Nevertheless, standing out was the performance of violinist Zoë Beyers who led with style and reliable engagement all evening. I’m delighted that a concert of folk songs was included at the Music at Paxton festival, a category of music that is so often overlooked. For Saturday afternoon’s concert vocalist Hannah Rarity and guitarist Luc McNally, occasionally providing some light vocal accompaniment, entertained the audience in a large marquee on the sun-drenched lawn located in a magnificent position overlooking the River Tweed. Clearly the audience savoured the duo’s set of fourteen songs of traditional material of a mainly Scottish character which felt so appropriate, as after all this is Border country and Rarity hails from West Lothian. The sincerity of Rarity and McNally’s performance and their evident enjoyment was infectious, drawing the audience into an enthralling shared experience. I was reminded that the rhythm of the songs is significantly dependent on the narrative with Rarity’s voice warm, poised and natural in tone, able to make every word count. Highlights were many especially Rarity’s rendition of the captivating Rabbie Burns’ ballad My Love is Like a Red, Red Rose with its lovely guitar solo. How the audience loved the traditional setting Good Looking Widow about the widow who is confident of obtaining husband number five. The opportunity of hearing Rarity and McNally again can’t come too soon! On Saturday evening the Gallery was filled for Steven Isserlis’ recital with Tom Poster ably replacing the advertised pianist Connie Shih. Undoubtably a master of his craft, cellist Isserlis excelled from start to finish in a remarkable performance high on musical intelligence and technical assurance that was entirely compelling. Isserlis opened his programme with Clara Schumann’s 3 Romances originally written for violin and piano that he had arranged for cello and piano. These are lovely undemanding pieces, with an undertow of melancholy never far away, that agreeably suited the cello tone. Fauré’s Romance and Elegy were foreseeable selections but none the worse for that. Isserlis displayed remarkable assurance giving an absorbing interpretation of the Elegy with its achingly beautiful melody drawing every ounce of emotion possible from the work whilst remaining totally dignified. Isserlis seemed total absorbed by the Robert Schumann 3 Fantasiestücke and 5 Stucke im Volkston as if inhabiting the various emotional states. Next, another of Isserlis’ arrangements using the cello part from Augusta Holmès Recitatif et Chante out of the rarely heard cantata La Vision de la Reine. It’s a deeply passionate work that I’m glad to have had the opportunity of hearing. To conclude the evening Isserlis and Poster played Franck’s Cello Sonata in Jules Delsart’s arrangement for cello which in its original form as a Violin Sonata is one of the most popular chamber music pieces in the repertoire. The performances had real spontaneity and a heightened level of expression with the final movement feeling like a joyous and uplifting celebration. For the Sunday afternoon concert in the Gallery, Benjamin Appl together with recital partner renowned Schubert specialist pianist Graham Johnson produced a fertile and rewarding association which paid the audience dividends. Based on Wilhelm Müller’s poems about young love in Die Schöne Müllerin (The Lovely Maid of the Mill) the Romantic hero is entangled in starry-eyed daydreams. 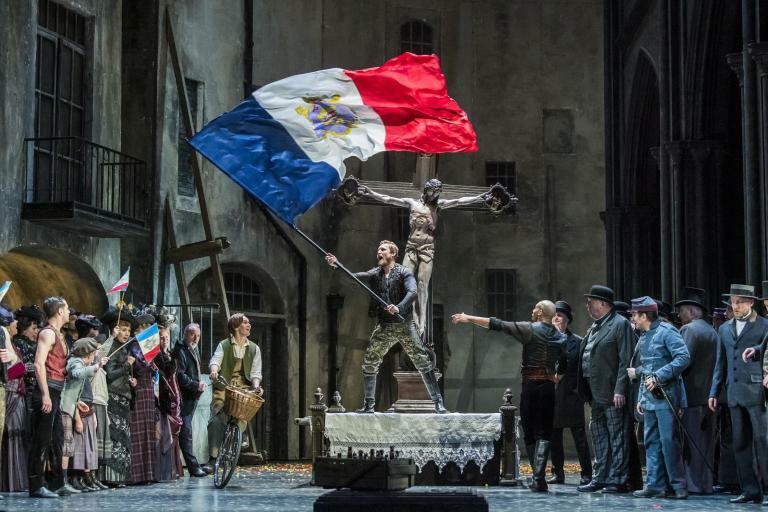 The German baritone was in attractive voice displaying ideal stamina in this demanding work that generally takes just over an hour to perform. A very tall handsome presence in his dark dress suit Appl was uncommonly assured with notable fluidity, able to move relatively easily to his high register. Innate was the expression of the smallest nuance assisted by an acting ability able to make even the slightest gesture count, yet ideally, I would have like slightly more emphasis on extremes especially additional delving into the depths of the score. At the conclusion everyone seemed transfixed and cheered repeatedly in appreciation for Appl and Johnson. Sunday evening was the final concert of the Music at Paxton festival with Chiaroscuro Quartet performing on period instruments in the Gallery. Taking every opportunity to hear a string quartet in recital it’s not too often that I encounter a group playing on gut strings with period bows and also a cello without an end pin held between the knees. Thankfully the muggy evening heat in the room didn’t seem to affect the tuning of the instruments unduly. Amid all this period informed practice I found amusing the dichotomy of using foot-pedals to turn the music scores on iPads. Opening with Haydn String Quartet No.30 nicknamed the ‘Joke’ the performance of Chiaroscuro was exquisite, marked by buoyantly vibrant playing which immediately served to lift the spirits. Following on was Beethoven’s Quartet No.3 in D major which, in spite of the numbering, was actually his first string quartet to be written. I couldn’t help being slightly disappointed that one of his late quartets, fruits of the final two and a half years of his life, wasn’t being played. It was a solid performance and I sensed that Chiaroscuro had given considerable thought to the interpretation. Demonstrated in the often-boisterous final movement Presto was a striking interplay between the individual parts and cohesion between the players. After the interval we heard Mendelssohn String Quartet No.1 an early work that I’ve always admired. Beautifully graceful and simple the much admired second movement Canzonetta is sometimes played as an independent work. Elfin-like in parts the faster paced, scurrying section in the hands of Chiaroscuro reminded me of the composer’s Midsummer Night’s Dream, Scherzo playing with a feeling of real immediacy. Overall it was a performance out of the top drawer by Chiaroscuro giving a real sense of an emotional journey and alive to every bar. Try as I might I just can’t fail to mention the glorious playing of Russian born leader Alina Ibragimova, a noted soloist in her own right, whose contribution was exceptional. Currently one of the North of England’s best kept secrets, Music at Paxton deserves a much wider circulation. For more about the ‘Summer Festival of Chamber Music’ click here. My understanding is that Paxton House is in Scotland and in Berwickshire. not Northumberland. Thanks for contacting Seen & Heard – the review has been corrected.